I just discovered that the television program 24 is available on Amazon Prime. I loved that show and just might be tempted to do a little binge watching since it's been off the air for a while and I can't remember all the story lines. During its original eight seasons, I picked up quite a few tips on compelling story telling. The cliffhanger hooks were always exciting, leaving unanswered questions, the foreshadowing of an attack, or a love dilemma. If you've ever had trouble formulating a hook to close a chapter, 24 just might inspire you! Who has to work with whom, and why is this a problem? Who has something to prove and why? Who has lost something significant and how does this affect his/her job performance? What is the conflict within the terrorist organization that will keep it from performing effectively? What conflict keeps the government in pursuit of the wrong lead? How detrimental will a past love be to a high ranking government official? 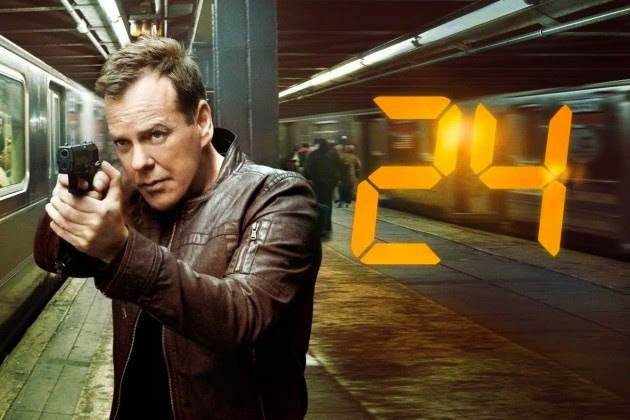 You can't have a good story without conflict, and 24 delivers! Were you a fan of 24? Also, do you have a favorite television show that's inspired your writing technique? Oh, I miss Jack Bauer.